Jharsuguda town is emerging as one of the economic hubs of India. It has many industrial units like Ultratech Cement of the Aditya Birla Group at Dhutra, SMC Power Generation Ltd, Action Ispat Ltd, Eastern Steel and Power Ltd, SPS Steel and Power Ltd, Utkal Alumina International Ltd, etc. Recently, it is reported that Jharsuguda will be the highest electric power producing town of India since industrial giants like Vedanta Aluminum Limited (VAL), Reliance Energy and Sterlite Energy Limited are developing power plants at Jharsuguda. As Jharsuguda is emerging as the fastest growing town in Orissa, it is also witnessing huge migration of workforce from all parts of India. To cater to this need, an airport is essential. The Jharsuguda airstrip was built during World War II. There is a proposal to make this fully operational. However, the State Government is yet to realise the importance of this airport as evident from the following highlights as reported by various media sources. It was reported that the Airport Authority of India (AAI) has decided to upgrade the airstrip at Jharsuguda into a full-fledged airport. So, the Government has decided to opt for a public-private partnership (PPP) for the work. In this regard, SREI, a Kolkata-based finance company had expressed interest and was negotiating with the Government. But so far nothing has happened. Recently, the Chief Minister informed the Odisha Legislative Assembly that the AAI is considering the proposal of the State Government for developing the Jharsuguda airport and it has asked for the required 815 acres of land free of cost. Responding to this, the State Government has requested the AAI to scale down their requirement of land as only 734 acres of land is available near the airport. 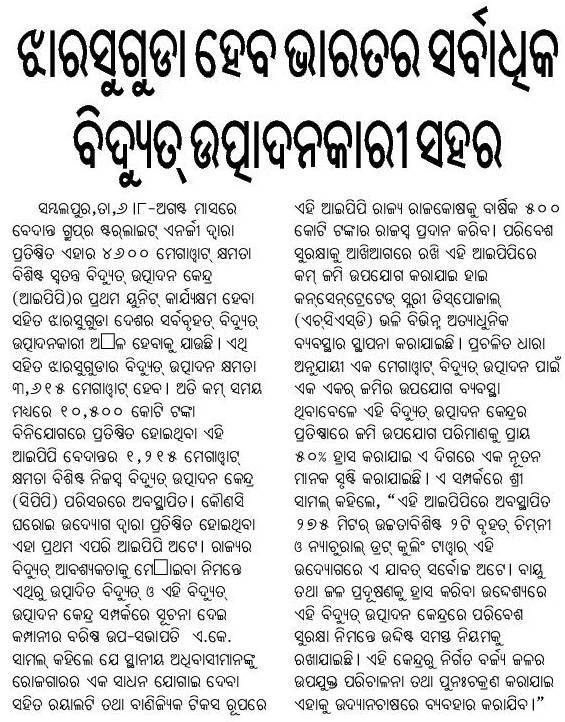 After analysing these reports about Jharsuguda airport, one can come to the conclusion that nothing much has happened in the past ten years. Are these announcements about making Jharsuguda airport operational only sweet talk? Are we going to see any passenger plane arriving or taking off in the near future? Is this the outcome of the persistent efforts of our leaders? In order to make Jharsuguda airport operational, the Odisha Government should provide the required 815 acres of land to the AAI. Providing 734 acres of land might hinder the future expansion of the airport. Moreover, if the Government is capable of acquiring land for building industries and dams; why can’t it acquire land for the development of an airport? The Government should complete the land acquisition for Jharsuguda airport at the earliest. Very soon our neighbouring State Andhra Pradesh will have two international airports. The Odisha Government should propose the AAI to make Jharsuguda an international airport. There is also possibility of connecting Jharsuguda with direct flights to China and Korea as Vedanta Group is employing many Chinese and Korean nationals at its Jharsuguda plant. This will further encourage Buddhist tourism at Ganiapali in Bargarh and Baud town in western Odisha. Presently, Jharsuguda airport can accommodate F27 type planes. Therefore, facilitation of small commercial flight should be encouraged. The Odisha Government should implement the master plan to be submitted by the administrative staff college of Hyderabad for Jharsuguda town to make it a 21st century city. In addition, the Government should push for establishing some State and national level institutes in this town. In this regard, immediate operationalisation of Jharsuguda airport is essential to cater to the need of whole western Odisha. This will accelerate the socio-economic condition of this region. The Government should take necessary steps to make this airport ready.